Raleigh was announced as one of twenty metros that made the short list for the Amazon HQ2. This follows years of accolades for Raleigh and the rest of the Triangle. If you already live in Raleigh, you feel it too – new construction is obvious both in commercial and residential real estate. Housing pricing has clearly escalated but remains “reasonable” as compared to other major metros. Some of the major indicators that site selectors for major companies look at when relocating or opening operations is population data, cost of living metrics, and labor statistics. These numbers all bode well for Raleigh. Zillow recently produced an infographic showing Raleigh ranked #2 in home sales, but why? 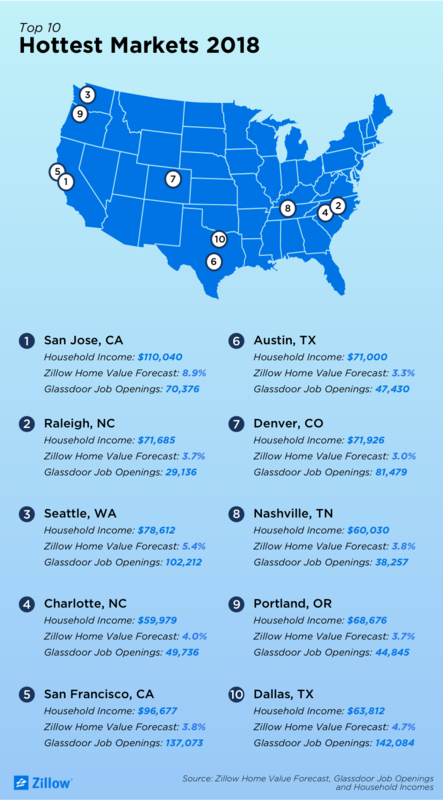 Raleigh has a Household Income of $71,685, a Home Value Forecast of 3.7%, and Glassdoor Job openings of 29,136. Zillow’s infographic confirms what everyone else already knows – Raleigh is on fire! For more details beyond the infographic, you can view the Zillow article here.